This iconic figure in Canadian music is introduced by Leslie Dala, and she comes in with her band, to the deafening applause and shouts of the gala night audience. She is slick-looking, esvelt, in her elegant black evening dress. She is barefooted, and Ava Gardner in The Barefoot Contessa comes to my mind. She sings sad songs, but then quips, "depressing crap". The audience laughs. A child cries out from the balcony, "I love you, Sarah! ", and the audience goes "Ooooo", sympathetic to the little girl, and again, the Canadian icon jokes: "Isn't it her bedtime?" This is the first time I've seen McLachlan perform, and I know now why she's loved by Vancouver. She says Vancouver is her adopted home, and we know why: she founded Lilith Fair and raised more than $7 million for charities. She has a big heart, and usually, people with big hearts are not appreciated. Perhaps that's why her music is sad. Is she an old soul who has reincarnated? It's as though she's living in the 70s, those flower children of that generation of hippies who only believed in peace and love, and sang folk songs like Dylan and Baez. Then she quips again and says that "I see Kenny Rogers when I sing this song". Again, the audience laughs. Again, an upbeat song, country, this time. The VSO now accompanies her and she says,"This song I've dreamed of singing with the VSO", and sans her band, just the VSO...ah, her voice, so pristine, so enchanting, as in a dream. 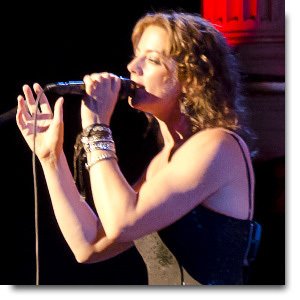 Sarah McLachlan is back, after a seven year hiatus, most probably because she got married and had to take care of her two young daughters. Her new album Laws of Illusion was released in 2010. She has won the Grammy three times, and the Juno eight times. During curtain call, the audience stood up, a prolonged ovation, for this highly appreciated Vancouverite who has graced MusicFest in this gala night.